Train will travel across three states - Rajasthan, Madhya Pradesh and Uttar Pradesh, started its maiden journey from Safdarjung railway station, New Delhi. RTDC chairman Pramod Sharma said: The luxury Train will run every Sunday. It will travel across three states — Rajasthan, Madhya Pradesh and Uttar Pradesh also will go to Jaipur, Jaisalmer, Udaipur, Khajuraho and Agra City. There were 61 foreign tourists on board, as the train started its maiden trip on Sunday. The train has on board a spa, gymnasium, deluxe saloons, specials suites, and two restro-lounges which make the journey truly a royal experience. Consisting of 35 coaches, the train has a ferrying capacity of 82 passengers in one trip. While the journey will cost $4,130 (Rs 2,14,760), one will have to shell out $1,600 (Rs 83,200) per day more if one travels in the special suite. 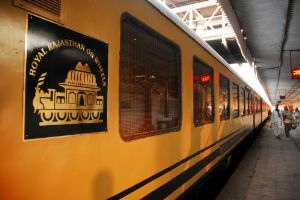 Mr. Sharma Said: "This train is better than 'Palace on Wheels' as it is more spacious and grander. It has every luxury travel which anyone would want,"
An Australian tourist Kent Vodan told, while the train was at Safdarjung station, New Delhi, India: "So far, the service has been really good and the crew is really hospitable.